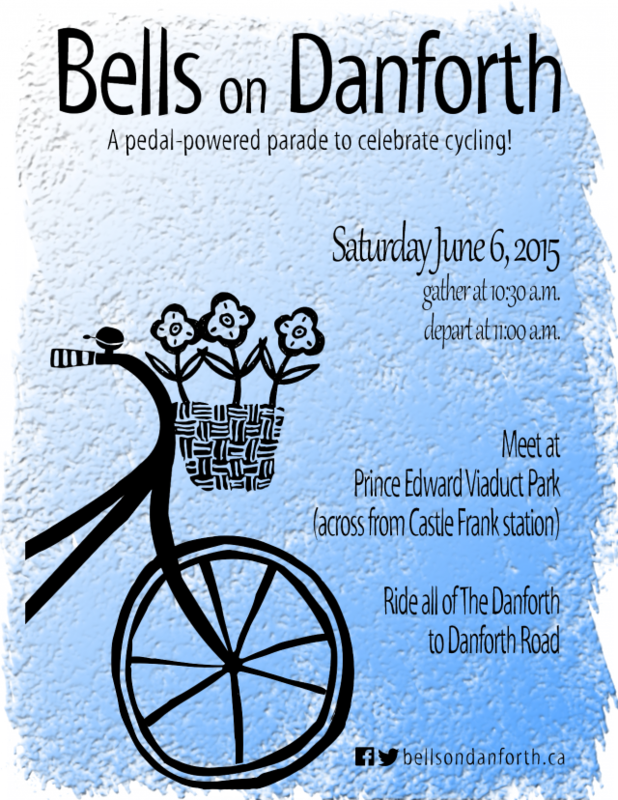 We’re bringing our bike festival to the neighbourhood on Saturday, June 18! 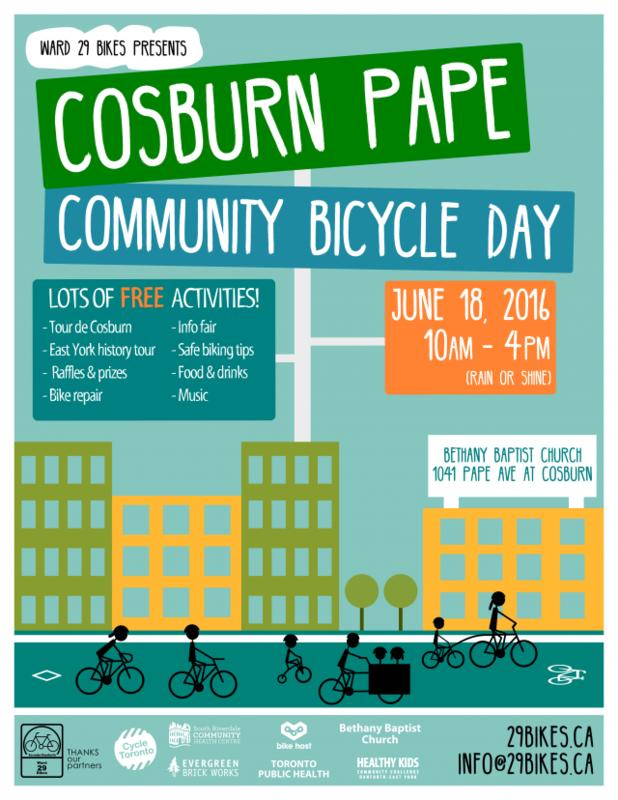 Join us for a day of activities including the East York History Bike Ride (1 pm), le Tour de Cosburn, and more! Visit our hub at Bethany Baptist Church (southeast corner of Cosburn & Pape) to get your bike tuned up, learn about cycling opportunities in the area, connect with CultureLink’s Bike Host program, and get cycling information and maps. See our event page for more information. Canada Day parade: Ward 29 Bikes members flying the colours. 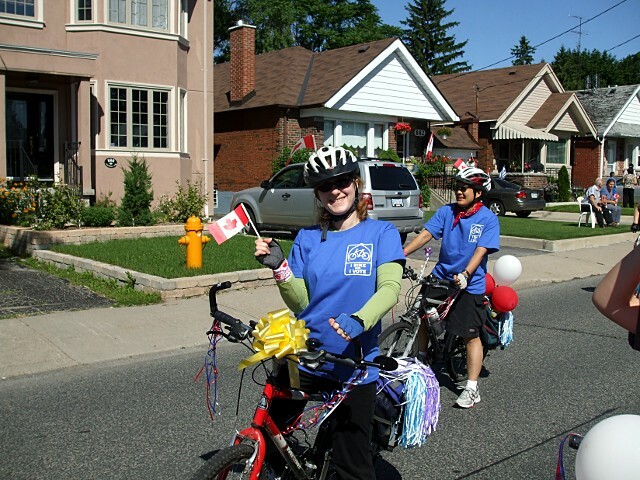 Ward 29 Bikes is riding in the East York Canada Day parade to celebrate safe, convenient, and fun cycling in our neighbourhood. And we’d like you to join us! This is your opportunity to fulfill your secret desire to be the centre of attention, riding through the streets of East York while thousands of people cheer you on. Parades make everyone smile, and the fun is doubled when you experience it from inside the parade rather than sitting on the curb. 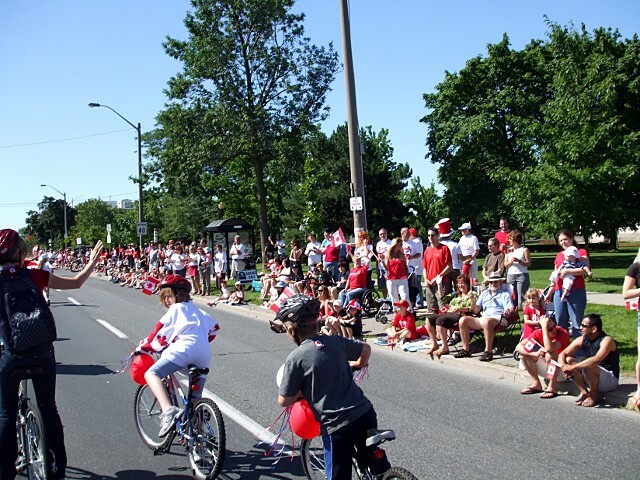 To join us in the parade, just bring yourself, your family, and your bikes to the parking lot near the old Zellers store in the East York Town Centre (Thorncliffe Mall) no later than 8:45 a.m. on Sunday, July 1. The parade leaves the parking lot at 9:00 a.m. and winds its way through the streets of East York to the big party in Stan Wadlow Park. Wear either red and white or Ward 29 blue. We’ll have some decorations for everyone’s bikes. 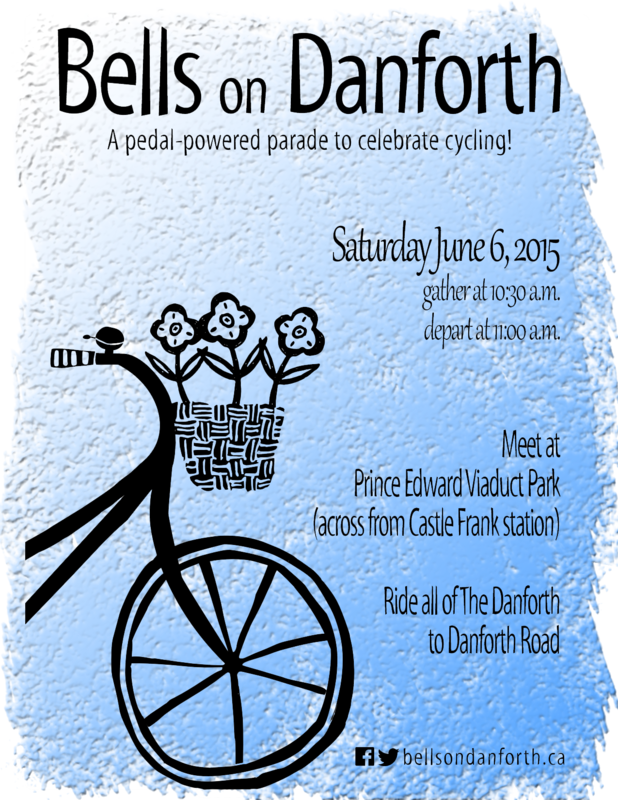 Contact us if you’d like more information or to confirm that you’ll be riding with us on Canada Day. Canada Day 2010: Waving to the crowd on Coxwell Ave.
Canada Day parade 2010: It's not the size of the bike, it's how you ride it.